So What does the Federal Reserve Do? I like to listen to economic news at night and recently heard this lady, Nomi Prins, who was a Goldman Sachs manager, then journalist, talk about the history of the Federal Reserve in America. 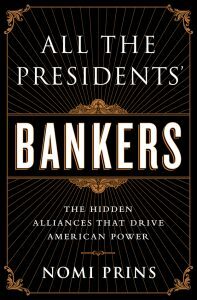 Her book, All the Presidents’ Bankers is a telling of the relationships between US Presidents and powerful bankers from 1907 to the present. In 1907 there was a potential stock market meltdown, (caused by some bankers (some people are always trying to game the system)) and Teddy Roosevelt called on his friend J.P. Morgan to fix it. That led to the creation of the Federal Reserve in America. So basically the Fed (the US version of a “Central Bank”) acts as a bridge to do what the Government wants in the economy, via handling Government money. Unfortunately, it seems that printing money (called “fractional reserve banking” and “quantitative easing”), and thus devaluing the currency, is what the Fed tends to do, because it’s easier to flood the economy with money than it is to actually solve the economy’s root problems. And right now, in 2018, it seems like the US is in the middle of a bigger bubble than it was in 2008 when the banking bubble burst, because the US is over 20 trillion in debt, and is at the point of not being able to make interest payments on the debt if the bond market rates keep going up. So buckle your seat belts! Author Michael HPosted on January 30, 2018 January 30, 2018 Categories FinTechLeave a comment on So What does the Federal Reserve Do?